this luminous life. – Page 4 – let your light shine. Gosh. How many times have I said that time flies? Because, dang, it does fly by. Quick! And now, I have a happy, curious six and a half month-old little boy that brings so much joy to my life. I still cannot believe it! And it’s spring! The grass has been mowed several times (successfully this year! ), plants are growing, bees are buzzing, everything smells like nature and I’m a week away from summer break. Wow. 701. trip to IKEA. 702. seeing old friends. 703. meeting their sweet little boy. 704. little boy being kind to my baby. 705. always having a supply of fresh eggs. 706. women’s potluck at church. 707. being with many kind women. 708. baby laughing at new faces. 709. an afternoon catching up with friends. 710. being exhausted from a full weekend. 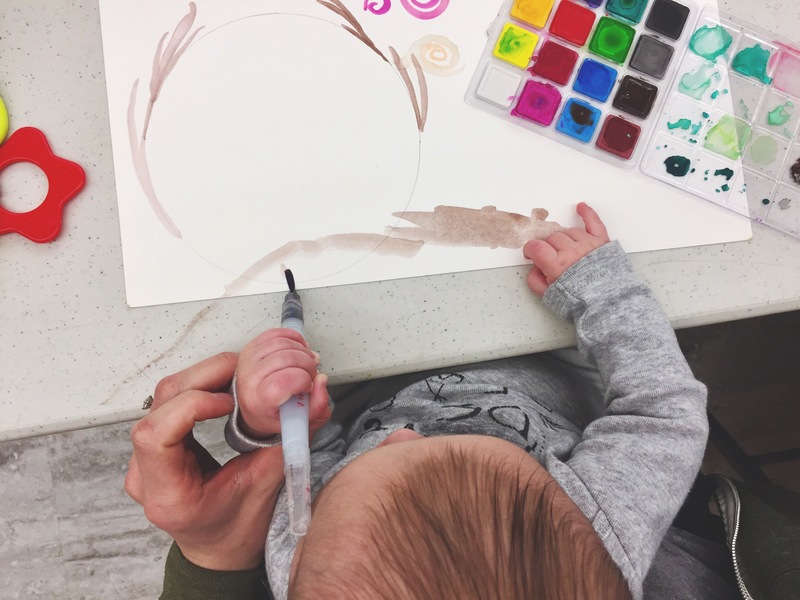 711. exposing baby to some watercolor art! 712. Mema and Papa visiting. 713. having a safer door on our house. 714. meeting baby goats! 715. Italian Beef sandwiches from Chicago. 716. tax refund giving us a bit of temporary financial relief. 717. paying off our truck! 718. lunch with a friend. 719. the end of the workday on a Friday afternoon. 720. friendly chickens. 721. freshly laid mulch. 722. brewery night with friends. 723. first time out with the baby, aside from dinner. 724. baby enjoying being out and then sleeping during the noise. 725. raspberry beer. 726. dog happy to be outside in the sun. 727. lazy Sunday afternoon. 728. green buds on trees. 729. flowers showing up. 730. taste of Spring! 731. smell of flowers! 732. baby belly laughs. 733. baby consistently smiling every time I walk into the room (awww)! 734. baby starting to sit up! 735. salamander on the doorframe. 736. brilliant sunrise. 737. big, green luna moth on the door. 738. trees in full bloom. 739. flowers on all the trees. 740. smell of spring. 741. sunrise peeking up, painting purple and pinks in the sky before disappearing as an orange haze behind the clouds for the day. 742. remembering to do something! 743. baby lambs frolicking in the fields. 744. teacher appreciation week. 745. waffle breakfasts. 746. surplus bagels from Panera. 747. water with lemon. 748. baby sitting comfortably on his own! 749. baby trying food and enjoying it. 750. seeing my little one get so excited about everything. 751. iced coffee. 752. warm enough for sandals. 753. laughter and connection in my small group. 754. pumpkin muffins. 755. baby being happy to see me. 756. peaches with cottage cheese. 757. new, clear sunglasses. 758. random snacks and treats at work. 759. grace upon grace upon grace. 760. Jeremiah 29:11. 761. Isaiah 55. 762. freshly mowed grass. 763. job security. 764. inclusion. 765. work luncheon. 766. rainbow striped pajama pants. 767. small group gathering to pray on our knees. 768. post-it notes. 769. blank pages. Dear Friend, I Know I’m A Terrible Friend Lately. Love, This New Mama. Whether you are back in Illinois, Wisconsin, Ohio, right here in Kentucky, or scattered elsewhere in the world, I’ve been a bad friend lately. I know this. I am aware of it constantly. I will continue to be a bad friend for a little bit longer. I used to be annoyed with people that stopped showing up. I hated when friends became too busy to respond to my texts. I hated when they had kids and suddenly changed. I hated when they never had time to meet up, even just for a quick hello. I thought it was rude when they didn’t say hi to me in passing or had to dash off quickly. I did not want to be like that. I was pretty good at staying in touch with you, popping in to say hello, meeting up for coffee, sending mail, buying gifts, visiting you, or giving you the support you needed. Admittedly, I took some pride in being (I thought) a great friend. Well, a new little boy appeared in my life and I became that person. As much as I didn’t want to, I’m now the person that doesn’t text you anymore. I don’t respond to your messages for days. I don’t tell you when I’m in town. I’m always in a hurry. I don’t wish you Happy Birthday anymore. I don’t send cards. My light doesn’t shine as brightly for you lately. I have stopped being a good friend. You have supported me so much through lots of big changes in my life lately and here I am, barely giving anything back to you. I know. I hate that. And I’m sorry. I’m sorry to leave you hanging. Please know I do care about you. I really do. I just need to put everything on hold. There’s a little boy who needs me more than anyone else. And it’s now my job to be there for him as much as I can. He needs me to hold him. To feed him. To play with him. To make sure he is OK. He needs me to love him as much as I possibly can. My husband and I are his whole world right now. And vice versa. This is my new life…. and I love it. Yet, I am being pulled in several different directions — my new job, my new baby, going back to school, being there for my husband, and an overall new kind of life. I am spreading myself thin. I am already struggling to give each aspect of my life all of me. No part of my life is getting my full, undivided attention. It’s hard. I feel like a failure every day because one way or another, I cannot do or be something that I wanted to. It’s an adjustment. Sometimes I have good days. Sometimes I have bad days. I have been told that every new mom goes through this. Don’t worry, I am OK! I am just different now. I know this. And I know you see this. I’m sorry. I don’t ask you how you’re doing because I’m trying to remember the last time my baby ate and whether or not I need to get another bottle ready. I’m distracted when you talk to me and in a hurry because I need to get him home for bed. I forget to do what you asked me to do because it’s one thing on my list of a hundred things. I don’t come to your party on the weekend because it’s important to me that my boy has a regular bedtime. I can’t show up because I don’t have anyone to watch the baby. I appear to get frustrated with you because I just haven’t been able to eat yet today. I stopped sharing all the positive things and leaving happy comments because, well, I’m just too plain tired to think anymore! This mom brain thing is real. Sometimes I’m only able to do things with one hand because I’m feeding my baby with the other. Sometimes I read messages without a response because he has started to cry, needs me to put him to bed, and then I fall asleep with him myself. Sometimes I’m completely available and responsive for about an hour and we finally get to chat, and other times, I seem to disappear. Sometimes we come in town and I don’t tell you because I know how exhausted I am, how cranky the baby will be, and how we don’t have time or energy to drive to a dozen different places. I know. I’m aware. I’m sorry. I think about each of you often. Your face. Your smile. Your words. The times we laughed. The memories we made. And I will scroll through my phone, “liking” your posts and occasionally leaving a comment or a message. But please don’t think I don’t care. I am proud of your accomplishments. I am happy when you are happy. I am bummed when you have a bad day. I pray for you when I see your requests. I love the photos you share. I just might not tell you. When you get frustrated with me for not telling you something or responding or being in touch or not being present as much, it makes me feel worse. It makes me feel like more of a failure. I am trying, but sometimes it’s not good enough for me or for you. Please help me by being patient and understanding. To those of you who are showing me this grace that I need, thank you. I’m sorry I’m just not a good friend anymore. But then… I’m not sorry. This is my life now. And at some point, I will go back to being the friend I was. I am here, but in a different way. Things will change again. I love you. Always will. I just love my little boy a little bit more than you.